I am trying to draw a special and contradictive plot : A circle with random distortions which have to remain constant regardless of how many times I build the document. The problem with the code is that whenever I make a change to it and rebuild the document, the "distorted" circle will have a different shape, since I am using the rnd function. 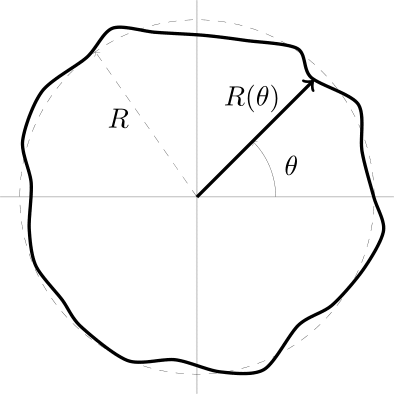 The reason I would like to have a constant-random shape is because I would like to denote its radius at an angle θ, therefore it has to touch the outline of the circle. Any idea on how to achieve such a thing? Not the answer you're looking for? Browse other questions tagged tikz-pgf random-numbers random or ask your own question.